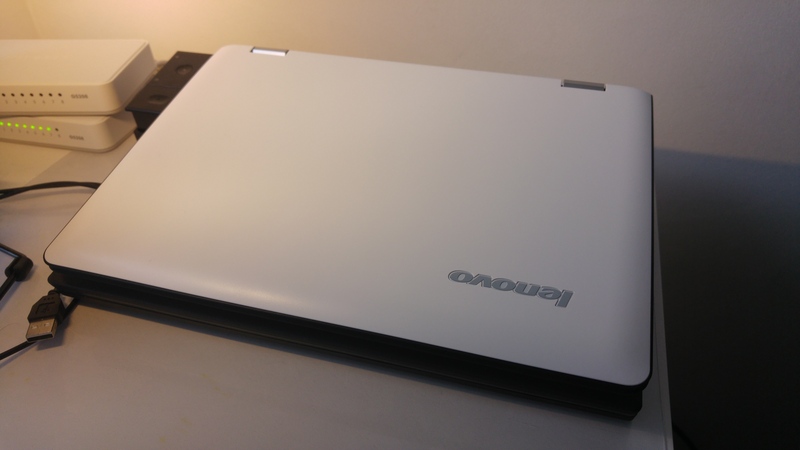 This week I ordered a Lenovo Yoga 300 to replace an ageing and underpowered HP Stream 14. The model I chose was the 11.6″ (11IBY) Intel Celeron N2840 with 4GB RAM and a 500GB HDD, a step up from the HP’s AMD A4 with 2GB RAM and a 32GB storage chip (well.. perhaps not in the CPU, but more on that later). I wanted a small, light convertible with a touch screen and the Yoga seemed to tick those boxes. At least until I got it. For a laptop that houses a 11.6″ screen it is large. Pictured above the Yoga is sat on top of a Thinkpad x240 – a laptop that houses a 12.5″ screen with reasonable bezels. While the Yoga is undeniably slimmer than the i5-wielding business powerhouse, it matches the Thinkpad’s width and depth with ease. Speaking of bezels, the Yoga’s are ginormous. They don’t look particularly small on Lenovo’s website, but actually seeing them in person reinforces how much of that whole screen area is completely wasted. I’m not sure of the technical reasons as to why they couldn’t have made the Yoga physically smaller to better match the screen they opted for, but the end result isn’t pretty. 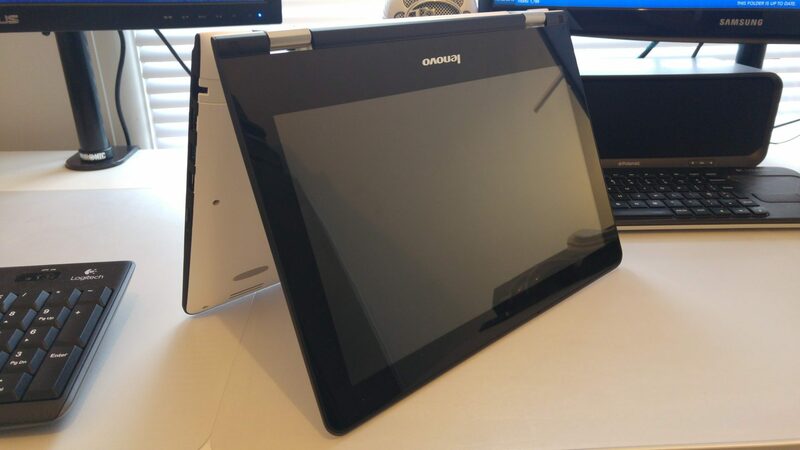 Lenovo don’t appear to publish the dimensions on their product pages for the Yoga here and here. Amazon do, but given they also provide dimensions for the x240 and there’s almost no comparison between the dimensions listed (41.4 x 27.2 x 8.2 cm vs 30.6 x 20.9 x 2 cm for the Yoga and x240 respectively) I couldn’t trust them. It’s also around 1.4kg. It doesn’t feel particularly light. As mentioned above I opted for the cheaper of the two models with 4GB RAM which came with a Celeron. On paper (and internet benchmarks, which I should really stop referencing..) it didn’t look like there was much in it between that and the Penitum N3540 and I therefore didn’t see the ROI on spending an extra £80 on the better chip. With the combination of Celeron CPU and a slower WD HDD it ships with however it became something of a combined bottleneck as I started putting it through its paces. The Yoga stalled frequently while browsing with too many (10+) tabs open, and ground to a halt continuously while updates were being installed “in the background”. Task manager often showed high disk I/O which undoubtedly had a knock-on effect on the CPU. Everything got a little better once I’d spent the evening upgrading it to Windows 10. For some reason it ships with 8 directly from Lenovo whilst Amazon and other retailers ship with 10 preinstalled. It was also at this point I opted to remove almost all of the bloat by going for a fresh install over a standard upgrade. As much as I appreciate Lenovo trying to help (“help”) by bundling their own tools, obtrusive AV, games and a garish battery indicator, I’d rather not have any of that (of course, we know Lenovo isn’t unique in filling their laptops with junk). I’d like to think performance benefits were had once the declutter and upgrade had completed, but that may have just been my imagination. I’m being critical, I admit. But then I’m used to even the cheaper laptops running on EMMC chips or SSDs, leaving the CPU to spend time on the important things and not scheduling I/O. Luckily, it’s easy to swap the HDD for an SSD using only a screwdriver. As a touchscreen device I can’t really say anything negative. The screen is responsive and worked well with touch, even if the resolution is a little below what I’m used to. The various positions the screen can be folded into with the Yoga’s unique hinges all worked well. The hinges feel sturdy and provide just enough resistance as the screen folds. They do not, however, prevent screen-wobble when touching the screen in “laptop mode”. It wasn’t until after I’d finished setting it up that I started noticing problems. As I settled down with a cup of tea for the evening to do some writing – the reason I got this laptop – it became evident the keyboard was a little unresponsive. Particularly the spacebar and keys towards the top right-hand corner would depress fine, but not type the resulting character(s) every time. I’m not sure what that’s like for most people, but for me it’s a little like struggling with slow internet. The keyboard itself, ignoring the issues, is a good size with adequate (but not great) travel. 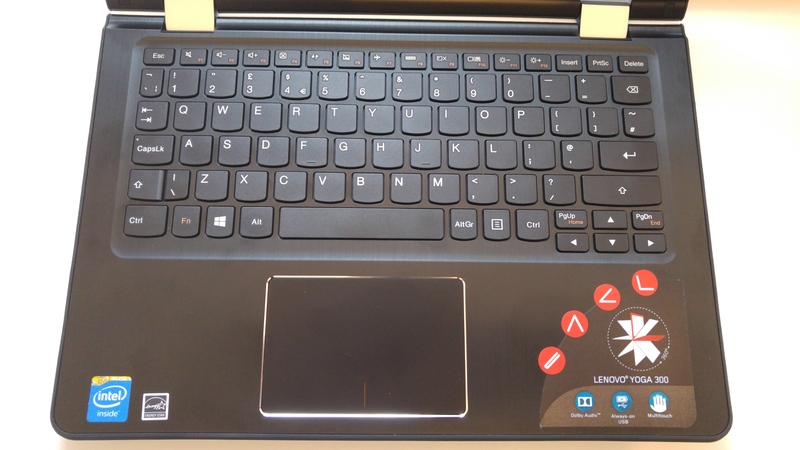 Just as with the screen there would be nothing wrong with bringing the edges of the laptop in closer to the edges of the keyboard to result in a smaller and lighter device, however Lenovo chose not to. Interestingly I had a similar issue with the volume rocker on the side of the Yoga; turning the volume down worked fine however it required an uncomfortable amount of force to turn the volume back up. This however was less important as the volume function keys on the keyboard did work fine. 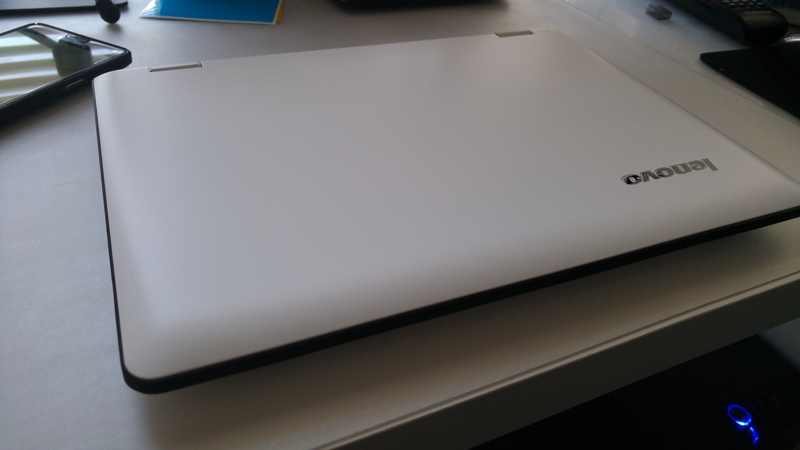 The trackpad feels nice, though could be larger. I’m not a big fan of having to click them generally, and that’s what’s required for a right click (two finger click) for some reason with the drivers pre-loaded. There’s also an option to click the bottom right corner (one finger click) to generate a right click but I’m not too fond of that either. So with the issues around the keyboard (apparently a common problem usually resulting in a keyboard swap by Lenovo on other models), the volume rocker, the so-so performance and size of the machine, I’m not particularly happy with it. While I’ve no doubt some won’t mind the extra size and weight associated with putting an 11.6″ screen into the body of a 12.5″ laptop, it’s not for me. I may have put up with it had everything worked as intended, but I’m actually a little glad it’s faulty as it’s motivated me to send it back and look elsewhere for a laptop that’ll suit my needs more closely.